News | Scand-Media Corp., Ltd.
ScandAsia – the news operation that has served Danes, Swedes, Norwegians and Finns living i Asia for free since 1993 – now appeals to its readers to buy a yearly subscription to the magazine for a small fee. The paper magazine will only be distributed for free to subscribers living in Thailand or Singapore. Mattias Malmstrom, the new CEO of Mynewsdesk AB in Stockholm, met with Scand-Media Corp., Ltd.’s CEO and founder Gregers Moller during a regional consultation with Mynewsdesk resellers in Asia held in Singapore at Mynewsdesk’s regional Headquarters at NHST Media Groups’s offices on Clark Quay on Monday 18 January 2016. ​Scand-Media Group celebrated the year end with a party on 25 December 2015 with a lucky draw for gifts from the suppliers. Scand-Media also has a profit sharing tradition, whereby 20 percent of the profit is given in equal portions to each member of the staff regardless of their company position. The total amount was this year 600.000 THB – evidence that the company remained profitable in 2015..
ScandMedia’s webshop www.scandshop.in.th has sold Danish and Swedish aquavit briskly in November and December this year. For the Nordic expats in Thailand, it is not really Christmas without a few “snaps” or “nuppar”. ScandShop.in.th has now got a few bottles of fresh supply – Gammel Dansk, Skaane Akvavit and Aalborg Jubilaeum – after having been sold out dry for several weeks. NACA – Network of Aquaculture Centres in Asia-Pacific – and Scand-Media Corp., Ltd. have been working together for 12 years with Scand-Media delivering all material that NACA needs in print. This year, 2015, the NACA reached a total of 1 million Thai Baht in payments to Scand-Media over the combined period of cooperation. Scandinavian Publishing joined on 3 June 2015 a networking event in Singapore with Julia Tan, Team Leader for Mynewsdesk Asia, and agents from Japan, Indonesia, Taiwan, Thailand and Singapore. From Thailand, the participants were Gregers Moller, ScandMedia’s founder and CEO; Finn Balslev, Scandinavian Publishing’s Marketing Director and Mynewsdesk Thailand representative Joakim Persson. The Swedish community in Thailand had quite a blast on Saturday 6 June 2015 at Radisson Blue Hotel in Bangkok. The crowd was about 200 persons, including quite many Thais as well. The magazine and news portal ScandAsia had been selected as the Media Partner of the event. 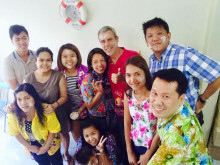 Scand-Media group staff celebrated on Friday 10 April the Thai Songkran – the Thai water festival held in the middle of April marking the Thai New Year. 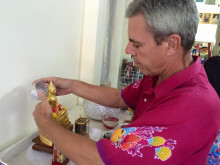 The company has adopted a Thai family tradition, where the eldest members of the family are revered by the yonger and in return receive the blessing from the elder members. Founder and CEO Gregers Moller gave the company Buddha statue its yearly wash down with scented water. Then one by one according to age the staff poured water over his hands wishing him well in the new year. In return, the CEO said a few personal words to each member of the staff about the past year or the time to come and put gently a bit of powder on both their cheeks. When all have had a chance to wish each other a happy and prosperous New Year, the formal celebration is usually followed by a more lively general splashing of each other with water. The office closed early to allow for members of the staff to start their yearly travel home to their families outside of Bangkok. There, the big water battle will rage over the weekend and into Monday and in some places include Tuesday as well. 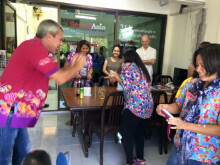 On Thursday, Scand-Media office will open after Songkran, allowing for Wednesday to return to Bangkok, but many staff members have taken personal leave and will not return to work before Monday 20 April. Songkran is about cleaning, purification, and fresh starts. Houses are cleaned, Buddha statues are gently washed with scented water, and elders are honored by pouring water respectfully over their hands.Although the origins of Songkran are far more religious, splashing complete strangers with water has become the main attraction of the festival. Dousing or sprinkling people with water signifies the washing away of bad thoughts and actions, and brings them good luck in the new year.As a procession and formalities end, a throng forms in the street to dance, party, and throw water in good-natured fun. To up the ante, many Thais add ice to their water or travel in teams that wear masks and carry large water cannons. You probably won’t mind the drenching; afternoon temperatures in April regularly rise above 100 degrees Fahrenheit. The first splash mayn be inconvenient, but once you are wet it is indeed fun and a great way to escape the scorching temperatures in April — the hottest month of the year. Songkran was once based on the lunar calendar, however, now the dates are fixed. The Thailand water festival officially runs for three days starting on April 13th and finishing on April 15th. .
Eighteen Danish journalists joined the third Bangkok Dinner arranged by Scand-Media at Thai Pan Restaurant in Copenhagen, Denmark, to keep in touch with former staff of the company living in Scandinavia. The dinner takes place in Copenhagen every second year. 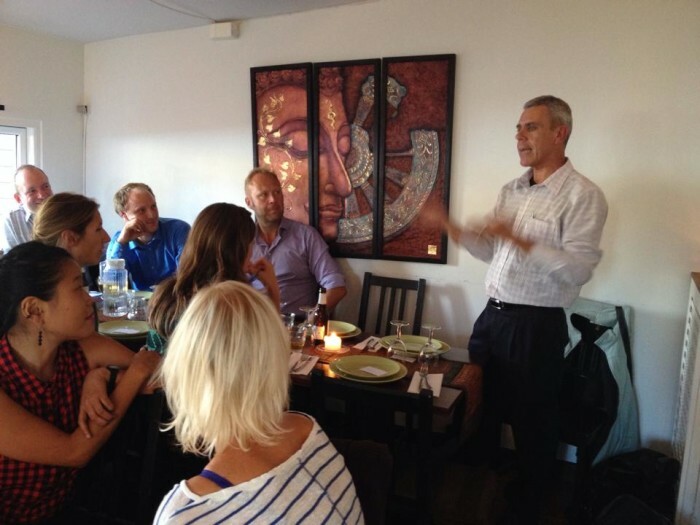 At this year’s Bangkok Dinner held on 20 August 2014, Gregers Moller, the founder and Editor in Chief of Scand-Media, briefed the participants on the current situation of the company and how it tried to position itself in the fast moving media landscape where advertisers spend less on Print Media and more on Content Marketing and other online media. The participants were mostly former Danish media trainees of the company located in Bangkok, Thailand, but a few were not in this category. Max Falck is Swedish and worked in 1994 and 1995 as Marketing Manager of the publishing company established only six months before – today he is General Manager of Ecophon A/S, Denmark. Jesper Kiby Denborg contributed for many years as a freelance journalist to several of the magazines published by Scand-Media – he is today Communications Manager at Copenhagen Airports. Rikke Bjerge Johansen joined Scand-Media as Editor and Foreign Correspondent based in Bangkok for several Danish media in January 2008. She left Bangkok by the end of 2010 after two years – she works today as reporter for the Danish daily BT. From Scand-Media in Bangkok participated also Disraporn Yatprom, Graphic Designer and Managing Director of Scandinavian PublishingCo., Ltd. Sine Neuchs Thomsen served second half 2013 and is currently continuing her studies as a journalist. The next Bangkok Dinner is already scheduled for Saturday 28 August 2016. Scand-Media Group has entered an agreement to represent the new PR tool MyNewsdesk in Thailand. The online PR platform will be introduced by Swedish marketing expert Mr. Joakim Persson who has joined Scand-Media Group to be in charge of the new product. Mynewsdesk is the world’s leading all-in-one brand newsroom and multimedia PR platform. It is a PR tool that makes it faster and easier for companies, journalists, bloggers and opinion leaders to gain relevant exposure – on their own terms. It matches interested users with press releases, videos, images and other content, all instantly search engine optimized and automatically published on social media platforms. Mynewsdesk is founded in Sweden and was originally a tool for journalists to receive press releases of interest to their line of work. In 2008, the company became part of the Norwegian owned NHST Media Group Asia with Asia head office located in Singapore. Since then, focus has been on developing the concept to be a platform for companies to communicate directly with their customers and stakeholders – including the media. Today, more than 23,000 companies use their Mynewsdesk newsrooms to publish and distribute their content, achieve greater visibility across search and social media, connect with key influencers, and tell their stories. Scand-Media with its focus on the Nordic business community in South East Asia has been keen to join the distributor net of Mynewsdesk since it started being rolled out across Asia. Scand-Media founder Mr. Gregers Moller signed the agreement with Managing Director of NHST Media Group Asia, Leonard Opitz Stornes in December last year. 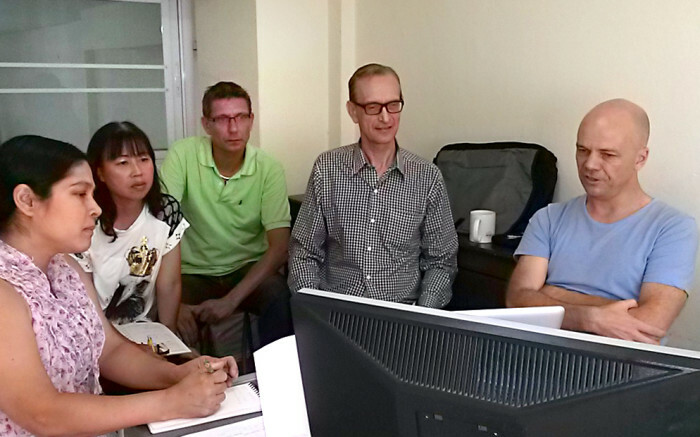 It was, however, not until earlier this month June 2014, that the employment of Mr. Joakim Persson to be in charge of Scand-Media’s introduction of Mynewsdesk in Thailand was officially approved. Mr. Persson has already been trained in Singapore by key staff at Mynewsdesk, Julia Tan, Marketing Communications Manager and Team Leader for Mynewsdesk Asia and Scott Andrew, Mynewsdesk’s Marketing & Client Services Manager in Singapore.